Poreč, Parenzo, in Latin – Parentium. In very interesting history longer than two thousand years, through the city passed whole European civilization from the Roman’s till the present time’s. 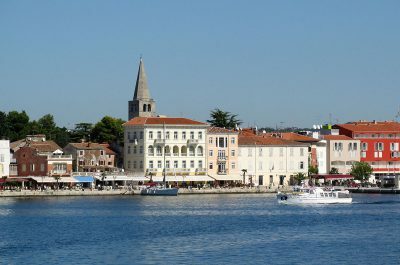 This city-peninsula has been colonized in the prehistoric times and the shape of a real city received in the beginning of Roman colonization on Istria in 40. – 30. BC. Two main streets of the city carry the same name as in Roman city – Decumanus and Cardo maximus. The city still have the big Roman square – Forum whit remaining temples of Martius and Neptunius. 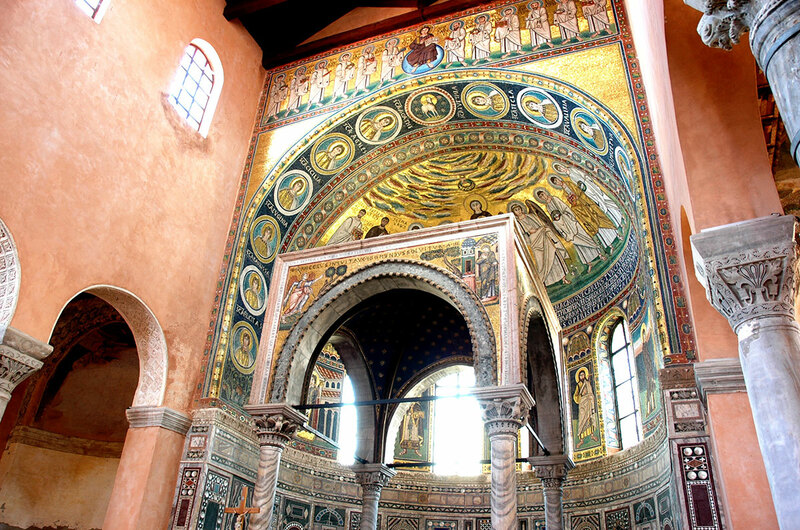 The most valuable monument of the city is a Bizantine building – The Euphrasius Basilica. This building is the only monument in Istria which is inscribed in the UNESCO list of cultural heritage. 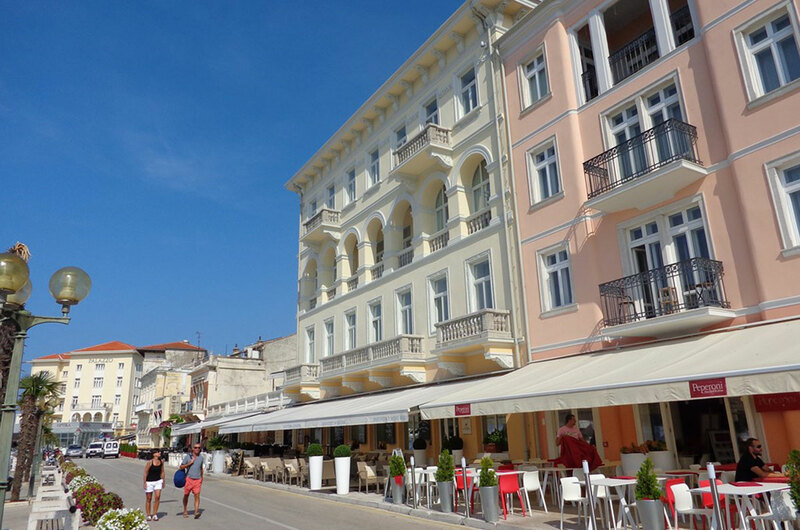 In medieval and later times the city was still growing strong and we have preserved monuments from Romanesque, Gothic, Renaissance, Baroque… In the last decades of 19th century and at the beginning of 20th century Poreč is witnessing a strong growth in economical field. This reflects many new buildings but also a rapid and strong growth of tourism. 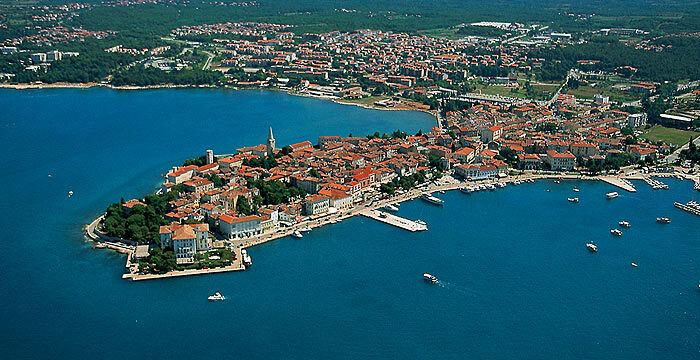 Since the 1950’s Poreč is the biggest and strongest centre of tourist on the eastern coast of Adriatic. Only in the last decade the city has won many prestigious awards as “The champion of Tourism” (1996., 1998. ), “The flower of Tourism” (1997., 1998., 1999., 2000.) and “The star of Tourism” in 1998. All of this witness that the city is the real place for Your vacation. The whole old city is a cultural monument but the most important of them all is the Euphrasian basilica. It has been built on 553. AD and in 1997. UNESCO took patronage on it as a cultural heritage important for whole humanity. The flashing and glorious mosaics made from gold, jewels, marble and many other expensive materials, on internal as well as external walls of the basilica are the best preserved Bizantine art in the whole world. The whole complex is made of the church, atrium, belfry, baptisterium, an the Bishops palace. In the palace is a small museum which tells the story of this unique place. 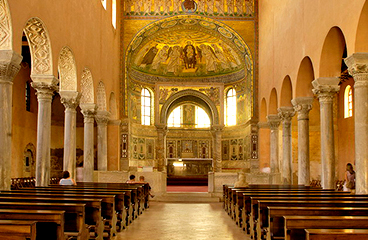 The Palma apartments offers You a special guided visit to the Euphrasian basilica for just 5 Euro per person.(min. 4 person.) The Palma apartments offers You also a special guided tour through the whole city including Euphrasius basilica for just 10 Euro per person. (min 4 person). Your guide will not be a tourist guide but an archaeologist and art historian with knowledge in the city past. 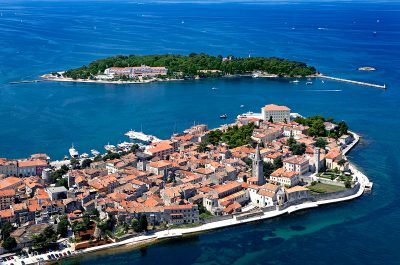 Poreč is situated in the middle of Istrian west coast, approximately in the same line (but over the sea) as Venice, in tame scenery of mild Mediterranean climate. A nice city, centre of tourism with the best arranged touristic accommodation on Adriatic. 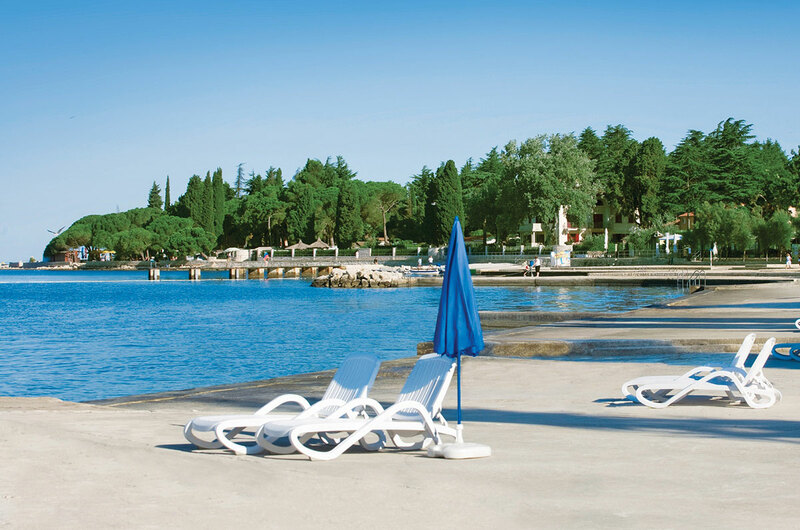 Poreč is the city of natural beauty’s, arranged parks, refined greenery and flowers. The pines and oaks reaches the sea along the city coast formed by little peninsulas and bays. The cleanness of the sea and the beautiful beaches along the city coast, the season of swimming from May till October made this city famous from antiquity. 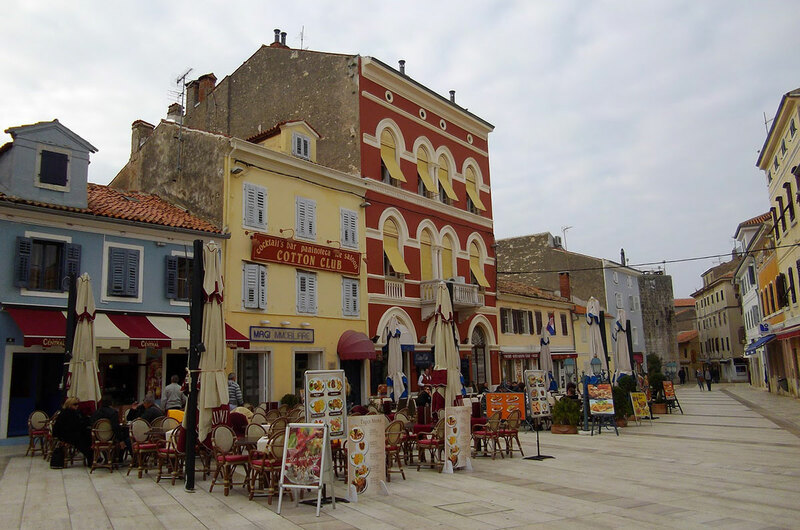 The Roman historian Kasiodorus wrote that in Poreč “patricians lead the life of Gods” when he was writing on cultural and natural characteristics of Poreč. The history of Istrian peninsula is very similar to the history of the city of Poreč. At first the peninsula was colonized by the tribe Histri and the peninsula still bears its name. After the Histri came Roman civilization which left some of the most important cultural monuments on our ground. Through the period of Middle Age various nationalities passed through Istria and left a lot of material to witness their presence to us today. From 13th century onward the coast was dominated by dodge of Venice and the central Istria by Austrian imperial court. From that time we have preserved a lot of Romanesque, Gothic, Renaissance and Baroque monuments. In 19th and in 20th century there was a continuous change of Istrian sovereigns. 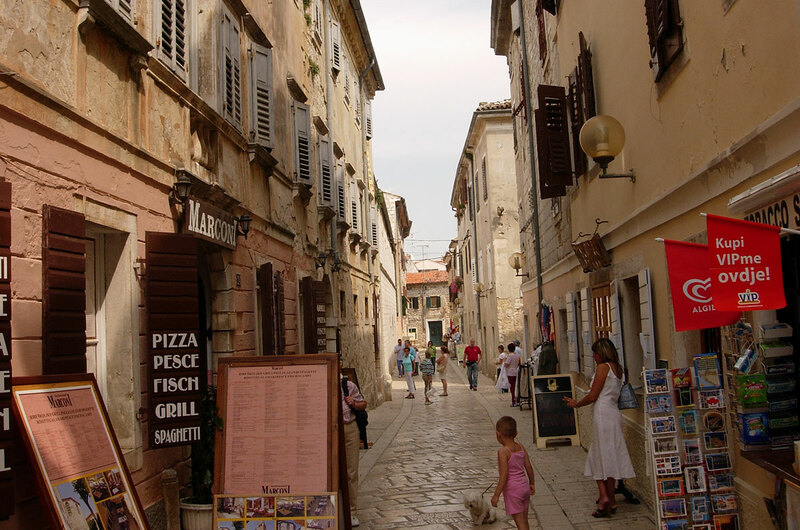 Today Istria is the most developed region in Croatia an tourism is one of it’s major incomes. Palma apartments will instruct you, if you have time and will, for one of many excursion which you can make while staying with us. Palma apartments offers you guided tours of old-city and Euphrasius basilica, but also whole-day or half-day routes to see our beautiful peninsula. 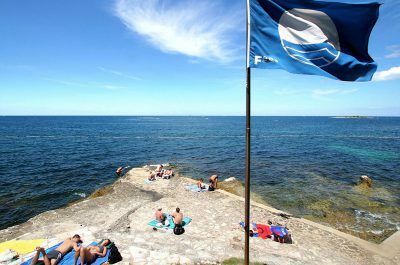 You ca visit ornithological park Palud (bird park) near Rovinj, natural and historic monuments of national park Brijuni, antique city of Pula, the capital of ancient Histri – Nezakcij, many medieval fortress on which you can enjoy splendid view on our peninsula…. And many others. If you have any special interest we will arrange a excursion according to your wish. 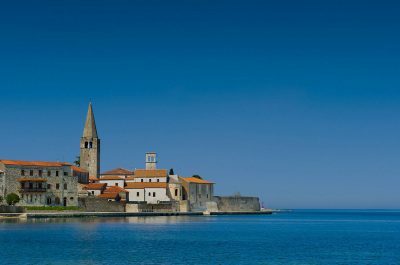 These excursions can be realized wit a guide or you can explore Istria (helped with our instructions) by yourself. Of course, you can cook all your meals in your apartments! 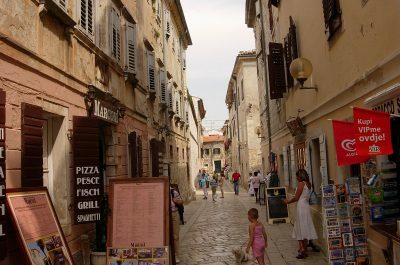 But if you want to try some of traditional istrian specialities – istrian ham, world famous truffle, delicious wine, istrian sausage, istrian soup or one of many istrian cakes we will recommend you couple of restaurants. 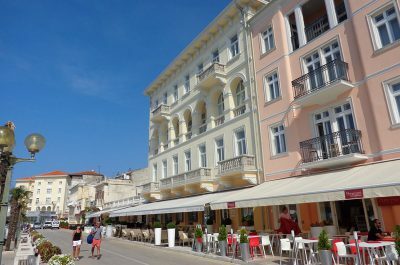 If you prefer sea food than we will recommend you restaurants which offer only the fresh fish and shells and all the treasure of Adriatic sea. And for the one who like to experiment with tastes and loves creative kitchen we have a list of selected restaurants of cousine nouvell.